Free X13-VSA PRO Voice Lie Detector Download from FilesPack.com! 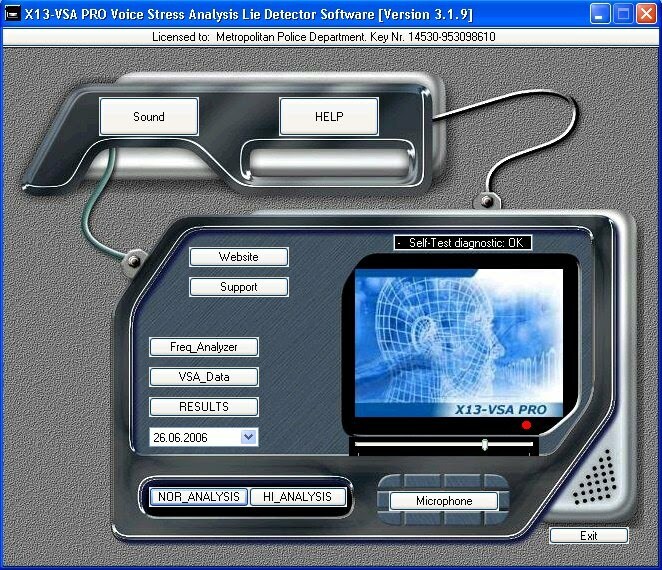 X13-VSA PRO With Ultra High Sensitiv truth verification and emotion identification Modul - Designed especially for security officials - is a Voice Stress Analysis Lie Detector Software. The most advanced voice analysis technology available today. X13-VSA PRO is an innovative, advanced and sophisticated software system and a fully computerized voice stress analyzer that allows you to detect the truth instantly. Based on an ingenious new and old algorithm to detect vocal stress. No one can lie to you any more because with X13-VSA you know what your friends and clients think about you. Visit our website for more information: http://www.Lie-Detection.com You can free download X13-VSA PRO Voice Lie Detector 3.0.1 PRO now.